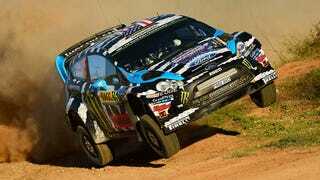 The WRC's only mixed tarmac/gravel rally started today in a special stage around the streets of Barcelona. It's a good one. The picture below comes from that first stage while the top gif comes from the pre-rally shakedown, where it appears there was a bit of an enjoyable off-camber midcorner crest everyone took with a bit of gusto. And yes, Kenneth H. Blockenheimer is in the running in his 8-bit Fiesta. Keep an eye on him.